It's a club. With fans. And we're playing them. That’s right, he’s the little Dutchman that could, even if he was played out of position during his short tenure at Milan and could only manage 7 goals in 25 league appearances, something I always found criminal. 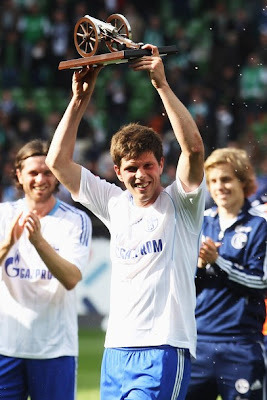 His kicker Torjägerkanone, or German top goalscorer award for last season was earned with those 29 goals in 32 league appearances for Schalke. But just like his replacement at Milan, he has teammates. And typically, coach Huub Stevens plays 10 of his teammates with him at any given time. The Bundesliga topscorer trophy is a cannon. So yes, there will be 11 players on the pitch in all, which could include (but is not limited to) a German keeper (Timo Hildebrand), and defenders from Austria (Christian Fuchs) or Japan (Atsuto Uchida) or Cameroon (Joël Matip) or Spain (Sergio Escudero.) From the midfield we could see an American (Jermaine Jones) or a Spaniard (José Manuel Jurado) or a Swiss (Tranquillo Barnetta) or a Greek (Vasileios Pliatsikas.) Or maybe we will see a Finnish forward (Teemu Pukki) or even a Brazilian (Edu.) And there’s a bunch of other Germans, too. But pay special attention to the defender Kyriakos Papadopoulos, as rumor has it Milan have been looking into him. I honestly have no idea if any of these players are injured, still with the club, or even alive, I simply typed this entire paragraph to show you what a wonderfully internationally diverse team Schalke have. "Only two years at the club and they've retired my number? That's sad." But at the end of the day, we are far more concerned with our boys. There is a chance that our Euro crew could return, but I doubt it. While many of them returned to Milan this weekend, they are not expected back at Milanello until Tuesday, meaning it is unlikely they will have even trained with the squad yet. In fact, I’m not even sure if they’ll feature much in the U.S. friendlies, which would be fine, since that will prevent them from being injured before the season even begins. Certainly, I hope Allegri will give some of the Primavera players some more time, maybe if he does, he will consider using the ones who are not already loaned out to other clubs during the season. Cristante, Valoti, and Ganz all looked intriguing, and players like Prosenik and Iotti might do well with some more time. Is there a Milan future for Cristante? Other than that, I suppose he might start with an El Shaarawy and Robinho attack; with Boateng behind them; Traoré, Ambrosini, and Urby in the midfield; and De Sciglio, Bonera, Yepes, and Taiwo in the back again. (Basically the starting lineup vs. Juve in the Trofeo TIM.) But I would love to see Mesbah given some time, I’d like to see more of Acerbi before I write him off as living down to my expectations, and again, I’d love to see some more of the Primavera boys. This should not be used to condemn or define the club. It’s a preseason friendly, which are typically meaningless and never have any bearing on our season to come. Take for example, the last two years, we played in the Audi Cup and came in fourth in a field of four teams. The first time, we won the Scudetto, this time, despite Injury Armegeddon™, we trolled the undefeated Juventus until the next to the last game. 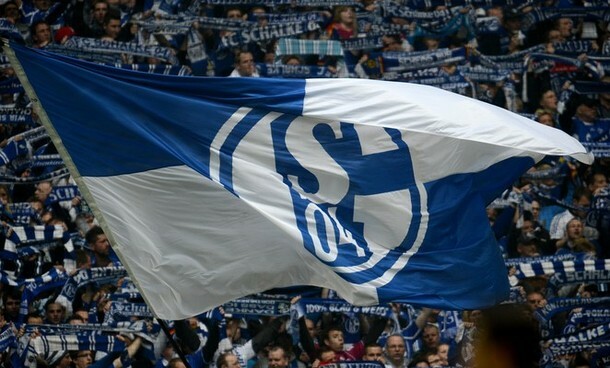 I’m not saying that if we have a poor showing vs. Schalke we’ll take the treble, or even that our season will go well. I’m saying that it’s preseason. 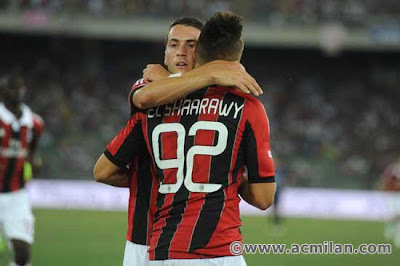 Ganz and El Shaarawy - Milan's future or future sales? We’re getting the ticket sales from this, even though we’re playing in their stadium. Heaven knows we can use every euro we can get at this point, so even if it were a fashion show and our boys had to strut up and down the pitch in the Collars of Doom™… okay, let’s hope we can see those lovely away kits maybe. Anyway, we’re getting money. 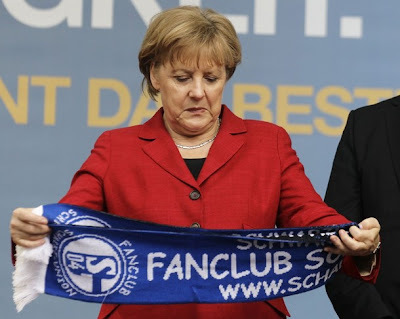 To play a friendly vs. a Bundesliga club who finished third last year. 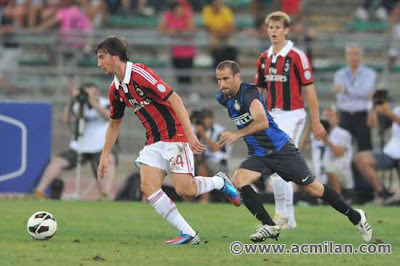 And maybe Huntelaar will get to show what a waste of a tactician Leo was and why Huntelaar should have stayed at Milan. Okay, we’re getting the money at least. That’s something.